Charles Kirbell White and his younger brother Frank Cuthbert White lived with their parents and other siblings, at Rose Cottage on Loughborough Road, Quorn, where three houses stand today (see artefact 1242). Their father George was a very well known public figure in the village. He worked for the Loughborough firm of solicitors, Woolley Beardsley and Bosworth, for over 50 years, he was clerk to Quorndon Urban District Council, and held several other offices, as well as being a local property developer. Frank White was killed on the 13th May 1915, at the battle of Frezenburg, a stage in the Second Battle of Ypres in Belgium. Charles, died in action in action in France on 1st September 1918. For more details see artefact 1797. 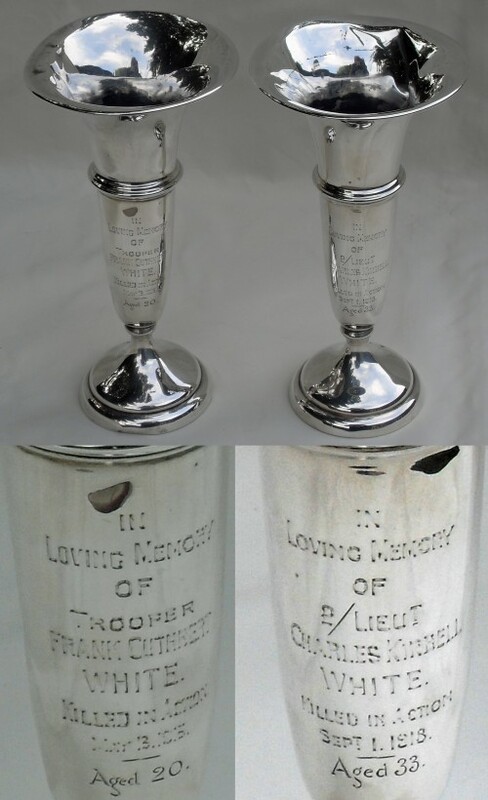 After the war their parents had this pair of fine silver candlesticks engraved in their memory.